creating a taste of integrity within each steep. The locations for our Honam Tea Estate have been carefully chosen for their ideal localities for producing the best teas grown in Korea. Before planting, each location had been examined for ideal temperatures, abundant rainfall, rich soil conditions and natural beauty. To ensure taste consistency in our teas, year after year, the tea estates are strategically distanced from each other throughout the province of Jeolla-namdo. Upholding strict standards, Honam Tea Estate uses eco-friendly agricultural methods that are harmonious with its surrounding environment. Each tender leaf is allowed to grow at its natural pace, free from pesticides. 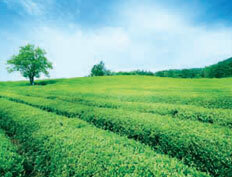 Jangsung Tea Estate, established in 1965, has tea plants that are 50, 40 and 30 years old, and is certitied organic. 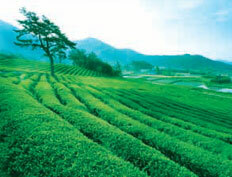 Located in the northernmost point of the province of Jeolla-namdo, the cooler climate makes this tea estate ideal tor tea shrubs reserved for malcha (powdered green tea). Established in 1979 on the foothills of Wol-Chul Mountain, Youngam Tea Estates is our biggest and most productive tea estate. The pristine lines of this estate's tea shrubs are recognized as one of Korea's finest, possessing the most desirable flavors. 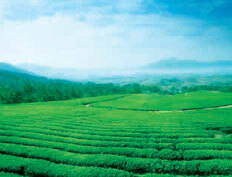 Established in 1981, Haenam Tea Estate is located in idyllic surroundings near the coast. The cool ocean breeze and abundant rainfall create the perfect climate for tea shrubs.